Built in conjunction with EMI and Abbey Road this EQ is based on the classic TG12345 console that was used to record various albums for The Beatles such as ‘Abbey Road’ and Pink Floyd’s ‘Dark Side Of The Moon’. Bringing another superb addition to Blue Pro’s already astounding line up of equipment, the TG12345 EQ is a useful and powerful tool for both mixing and mastering applications. It is a very coloured EQ but the line geranium amps alone are enough to warrant purchase of this unit. As soon as you switch in the TG12345 these line amps seem to add an extra dimension to the sound. You can hear extra harmonic detail around the 2kHz register in particular, which can be very useful on certain mixes. 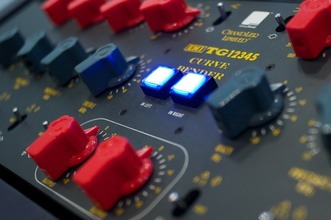 With so many records made purely in the digital domain these days the TG can help add subtle warm colour and prestige to an otherwise hard clinical recording as even just a coloration process. In terms of tone shaping it’s great for breathing a little life into your bottom end. It’s punchy, rich and also capable of taking a lot of level and offers a very heavy +15dB cut/boost for each band. This newest EMI equaliser continues the tradition of EMI EQs that started in 1951 with the RS56, affectionately entitled the Curve bender by EMI designers and continued with the TG12345 in 1968, and TG12412 in 1974. This version takes the simple but beautiful sounding TG12345 equaliser and realises it in a fully featured and rethought package for today’s use. During his mixing of numerous Beatles related projects including, Anthology, Yellow Submarine, and Imagine, Peter Cobbin thought of having a fully featured and ultimately flexible version of the original desk EQ units. It’s great to be able to offer the tonality a TG console offers without using it exclusively on all signal paths. The full console can be a little aggressive in the upper mids and top end and can be can susceptible to noise and mains hum.